Making History student Jess Bourke presents an Indigenous story from WWI. Students of Bendigo’s Bachelor of Arts Making History subject have given voices to those long silenced this year. A host of history projects have just been made public, online and in the campus library, airing forgotten and never-before-told tales of heartbreak, struggles and intrigue. Archaeology and history lecturer Emma Robertson says the subject aims to introduce students to a way of presenting history that will interest people outside of the university classroom. She says this year’s cohort has embraced the project-based work, using different mediums to tell a story, including digital, film, artefacts and posters, which can prepare them to work as historians in a range of sectors, including museum curatorship. Grabbing the public’s attention shouldn’t be hard with topics such as Bad Girls – Secrets, shame and scandal in Australia’s past adoption practices, Who’s Afraid of Baby Francis? – Neglected and delinquent children in 19th century Victoria, Silence is Golden – The untold story of the shadows on the Victorian goldfields and The Unheard Voices of Glenrowan – The tale of six Aboriginal members of the Queensland Native Police and their involvement at Ned Kelly’s Last Stand. These projects and more can now be read on the Making History blog. “Aboriginal history is my main area of interest,” she says. “We studied Gallipoli last semester so I thought I would continue with the war theme. 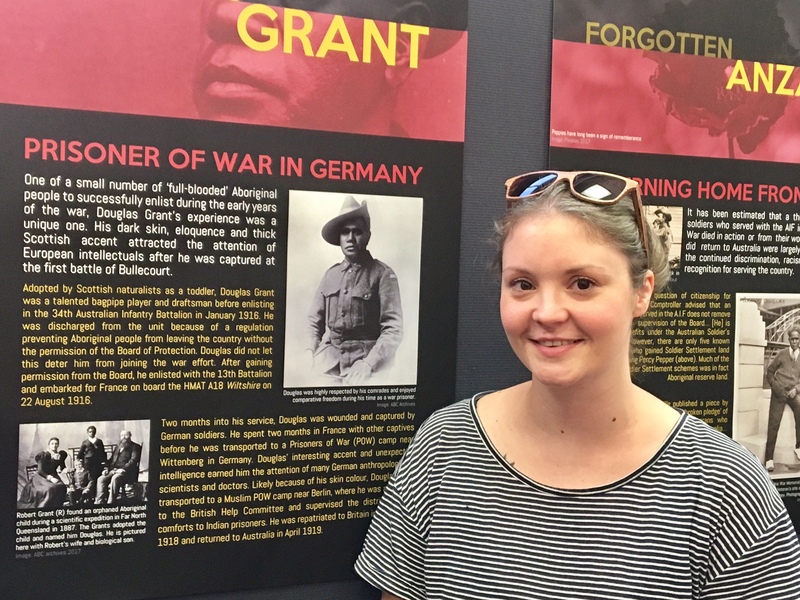 Jess shines a light on Douglas Grant, an Aboriginal soldier who made quite the impact in Germany. Sarah Austin and her display of 1950s ‘celebrity chef’ Mary Smith. 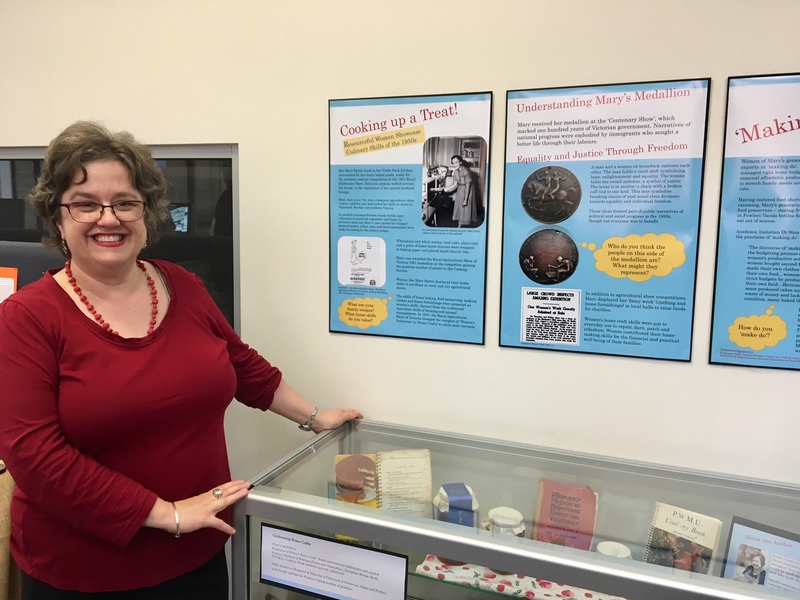 Fellow student Sarah Austin has used the story of her great grandmother Mary Smith to highlight women’s experiences post-World War II. Sarah jokes nanna Mary was like the forerunner to Masterchef. She was a champion agricultural show exhibitor in cookery and home crafts. The Making History project launch in the library last week was Sarah’s last La Trobe commitment after a 10-year study journey. So, history done, what does the future hold for Sarah? “I’m thinking about doing my honours at some stage,” she says, inspired by a story she found about women at the Castlemaine Woollen Mills striking over poor working conditions while working on a WWI contract in 1914.